After you’ve add domains to your Office 365 environment (using PowerShell of course) you might want to add users as well. In this blog post I’ll discuss how to add users, add and change licenses, remove users and change password settings. When creating a new user in Azure Active Directory you can use the New-MsolUser command, combined with the results of the Get-MsolAccountSku command for the license information. You can use the –LicenseAssignment and –UsageLocation options to assign a proper license. When creating user accounts and Mailboxes in Office 365 the default Microsoft password policy is applied, which means you have to change your password every 90 days. While it is a best practice to change your password on a regular basis not every customer is too happy with this. I can think of one exception and that’s a service account, this makes sense to have the password set to never expire. 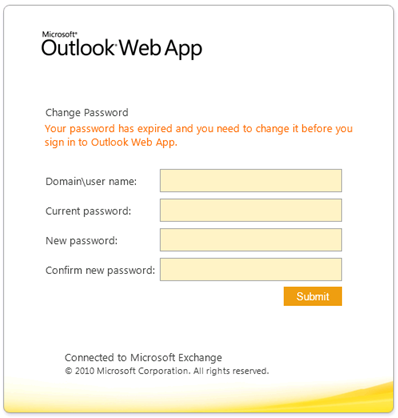 In Exchange Server 2010 SP1 there’s the password reset tool, a tool you can use when a user’s password has expired, or when the administrator has reset a password and checked the user must change password at next logon option. Using the password reset tool from the Internet when published using TMG2010 is a different story. By default this is not working so some changes have to be made to the TMG’s web listener. Logon to the TMG Server and select the appropriate web listener. Select the Forms tab and check the Use customized HTML forms instead of the default. 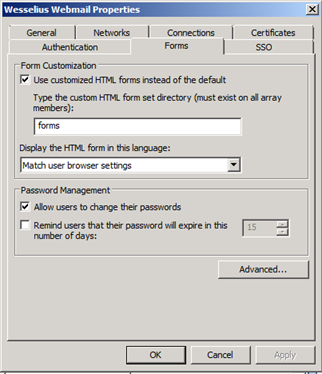 The custom HTML form set directory must be set to forms, this is the directory on the CAS server where forms are stored. Also check the Allow users to change their passwords option. Now when a user’s password is reset with the user must change password at next logon option the password can be changed via TMG.